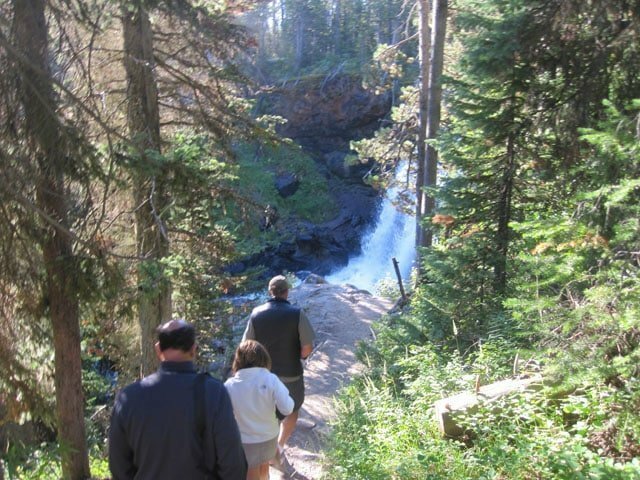 The post Discovering the Grand Tetons and Yellowstone with Wildlife Expeditions of Teton Science Schools appeared first on A View To A Thrill . 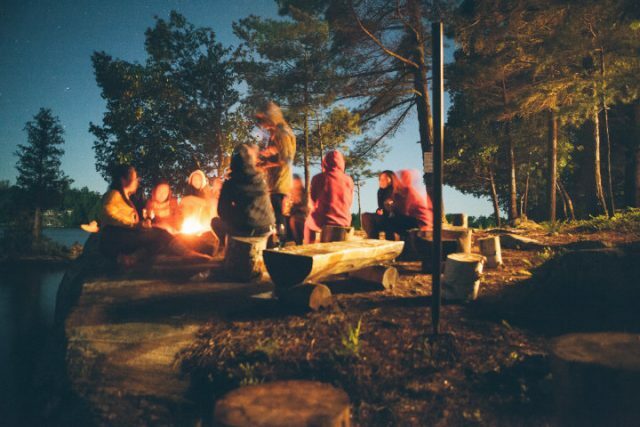 Teacher Learning Center “combine nature-based and outdoor education with innovative leadership strategies of educational reform.” Science teachers throughout the country come to hone their skills by studying this delicate eco-system. Journeys School is a pre-k to the 12th-grade program that “consists of four critical pillars that act together to empower students to change the world”. 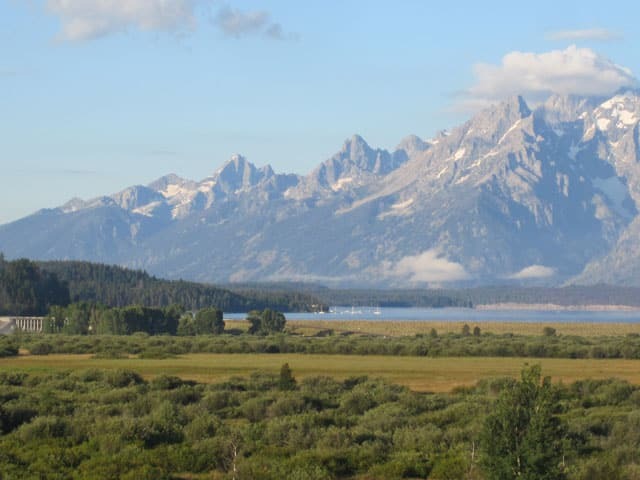 Conservation Research Center “was formed in response to the growing need in Jackson Hole and the Greater Yellowstone Ecosystem for responsible conservation and land stewardship”. Wildlife Expeditions ” has a well-earned reputation for locating all kinds of wildlife in the Greater Yellowstone Geo-ecosystem and providing fascinating educational experiences in a fun and relaxed environment”. Naturally, our tour was a part of the Wildlife Expeditions component of the school. All of the tour guides are bonafide Biologists who not only led you to the spots that made Yellowstone famous but taught you so many great details that you actually felt as though you were on the most inspiring field trip ever. The full-day tour began barely at the crack of dawn and ended around sunset. We boarded a large safari styled four runners with roof hatches for easier viewing. Mark, our guide, was friendly and a little too chipper for that hour of the morning. However, his enthusiasm was instrumental in snapping me out of my stupor. That and the lovely thermos of coffee that he had on hand for tourists who refused to go to bed on time the night before. At noon, we had made our way through the Tetons and Mark stopped at a lovely scenic spot where he set up a tasty picnic lunch for us to devour. Continuing on, an hour later, we got to spend the bulk of our time in Yellowstone where we learned about the history and mystery surrounding it. 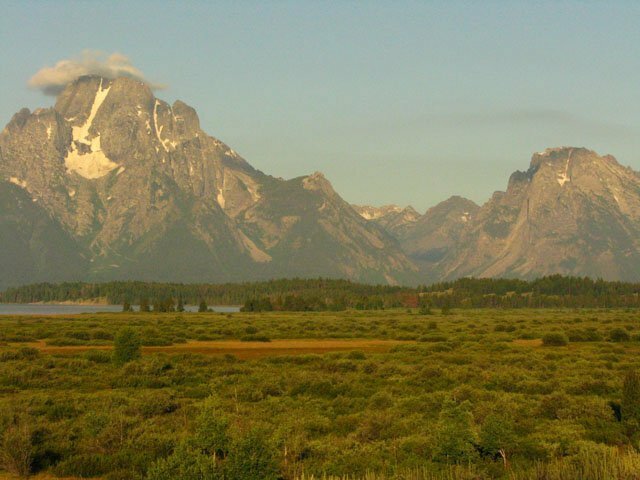 During westward expansion, the government decided to protect and not allow development in the region now known as Yellowstone and the Grand Tetons. At first, it was scoffed at because there was literally land as far as the eye could see so what was the point because the land was inexhaustible. It worked out well because the idea of having a protected area that everyone could enjoy was a good one and thus, the first National Park in the world was established. actively shoot up boiling hot water from underground. boiling water pooled on the surface. are steam vents blasting from underground. are where the mud is actually boiling. When early explorers came and noticed all of these hydrothermal features, their only explanation was that there had to be a volcano nearby. Of course, there was no evidence of a cone-shaped above the ground volcano and it wasn’t until satellite imagery was invented that they could see volcanoes close to the earth’s crust. The explorers had no idea that they were standing in the middle of the volcano. When a volcano erupts it spews out molten rock from the earth’s core and after it’s finished erupting, the space that the rock once occupied is now vacant and over time, the crater walls of the volcano will collapse in on itself. Historically, there have been 5 major eruptions at Yellowstone. One happens about every 600k years and the last time was 640k years ago, so we are way overdue for an eruption but that’s from a geologic standpoint where timetables are much different from ours. It’s thought that a massive earthquake will take place before an eruption. 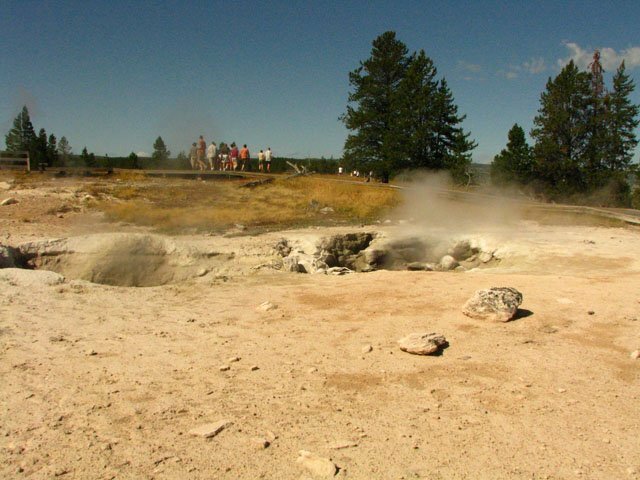 There’s an average of 6-8 earthquakes that occur daily at Yellowstone; people aren’t aware of the seismic activity which ranges from 1-2 on the Richter scale so not really large enough to notice. 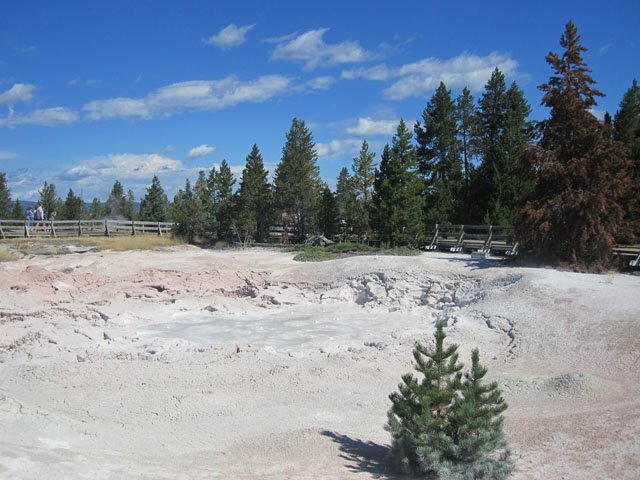 Yellowstone is constantly monitored so all activity is easily measured by scientists. The hydro-thermal features act like pressure releasers. 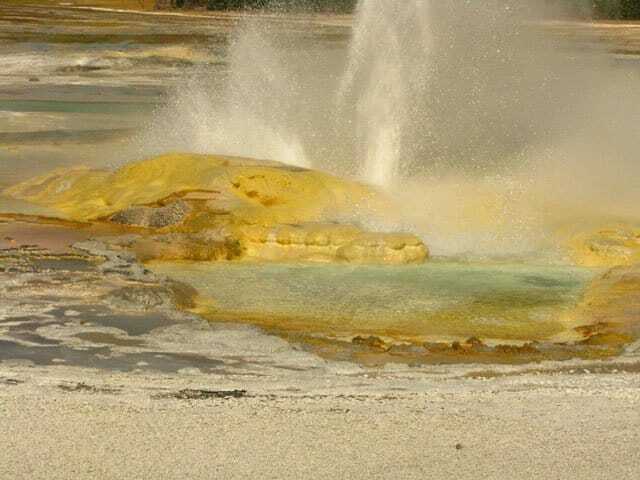 In 1959, there was a 7.2 magnitude quake right outside the western boundary of Yellowstone and it affected the Teutonic plates underneath the pressure releasers, the hydrothermal activity, and its plumbing structures. 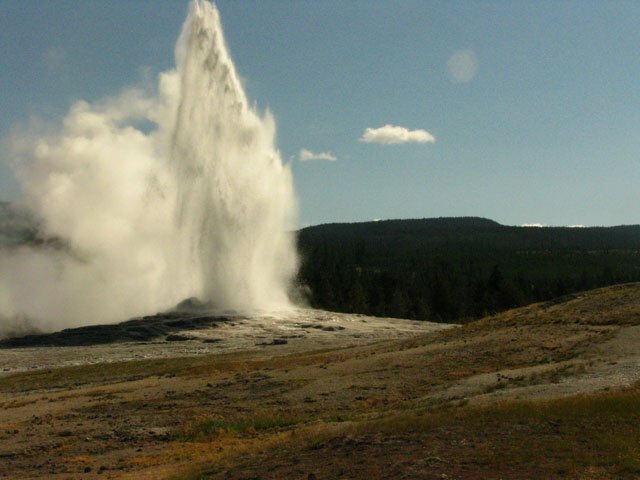 As a result, some geysers stopped erupting and formerly grassy areas suddenly began to spew steam. which not surprisingly, gets the most press. has a 300 ft waterfall over the canyon; neither are discussed that much in the press. the largest lake in North America; above 7k ft in elevation. There are no boat size limitations on this lake and it is completely surrounded by 15.3 square miles of wilderness and freezes over in the winter. 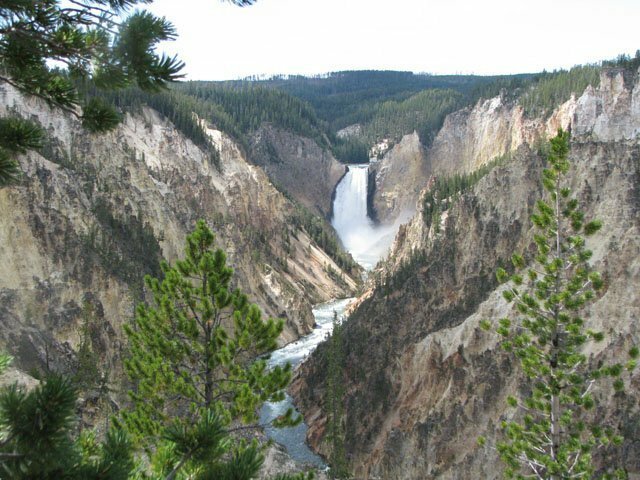 is 330 acres in size; Yellowstone is 2.2 million acres. 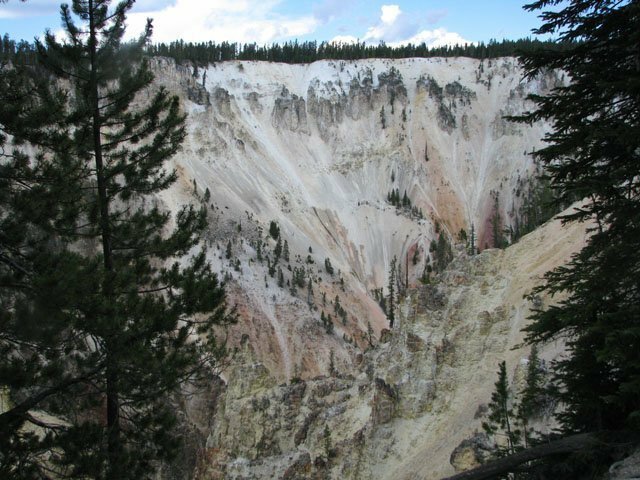 Yellowstone used to be the largest National Park in the lower 48 until 1994 when a wilderness area was added to Death Valley National Park giving them a total of 3.3 million acres. However, Alaska’s Wrangell St. Elias is the largest with 13.2 million acres. 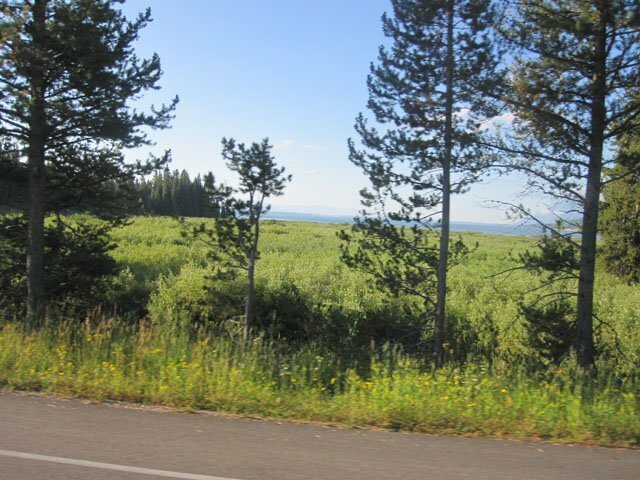 There is a six-mile stretch of land separating northern edge of the Grand Tetons and the southern tip of Yellowstone. This stretch of land consists of forests that are under the control of the Department of Agriculture. The National Parks surrounding it is under the Department of the Interior. Therefore, hunters can actually use that 6-mile stretch to hunt. 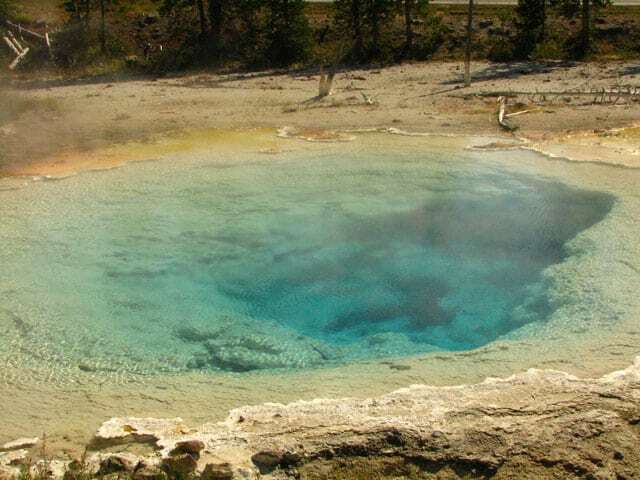 However, they are forbidden to use either the Tetons or Yellowstone. During the hunting season, this forest is flooded with hunters who are attempting to get elk, moose or deer as they migrate from one park to the next during the winter. 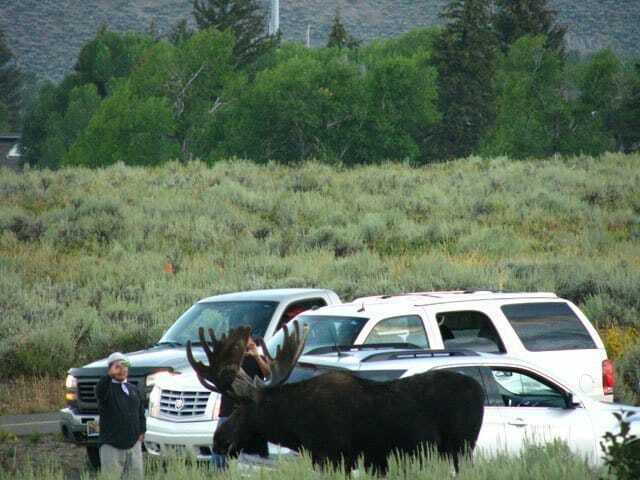 The vast majority is hunting for sustenance and will target the female elk (cow) for instance, the hunters who are strictly hunting for the game will target the males because of their enormous size. As long as they do not cross into National Park territory, it’s all legal but it does affect the bloodline of the Elk over time if the best and strongest are brought down by the hunters. 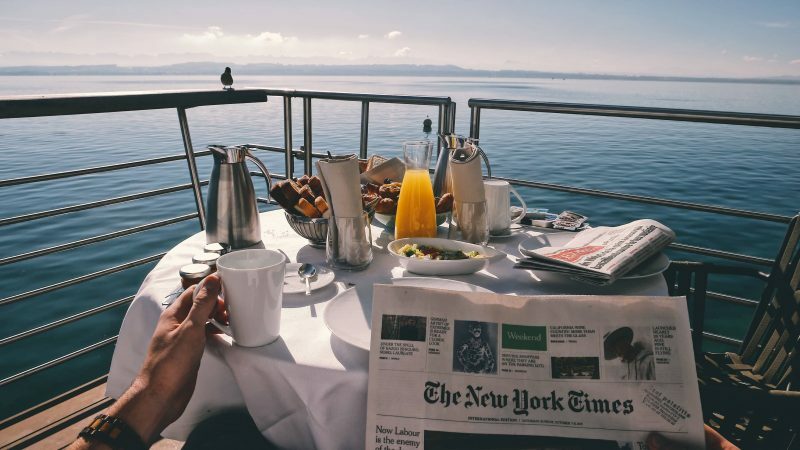 The post Booking an Alaskan Cruise? Check out the Port Valet Program! appeared first on A View To A Thrill . 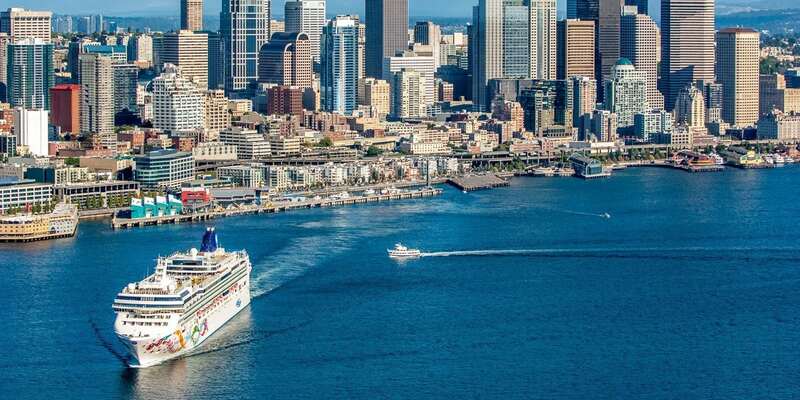 Are you heading out of the Port of Seattle for your dream Alaskan Cruise soon? Well, we have great news about a free fantastic service that’s offered to cruisers called the Port Valet program! 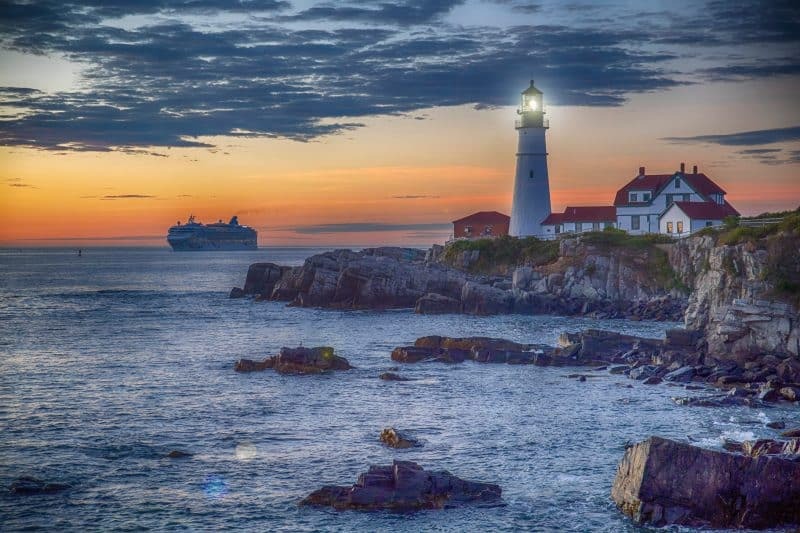 Experienced cruisers are familiar with having to pack and leave their luggage outside of their cabins the night before they are scheduled to disembark from the ship at the end of their cruise. From there, crew members would pick up and transfer your luggage from the ship directly to the cruise terminal (where they are arranged via a color-coded system) once the ship arrives back to your home port. You would then have to sift through the confusion and lug your baggage to the nearest taxi. The Port Valet aims to change all of that. Their free service will pick up your luggage and transport it not only to the Sea-Tac airport but will arrange for it to be sent to your home airport! You will find an enrollment card/sheet in your stateroom during your cruise. Check with the ship’s Guest Services desk if you have specific questions. The enrollment card will ask for details like the names in your party, flight info, baggage info, etc. Be sure to be as accurate and detailed as possible. 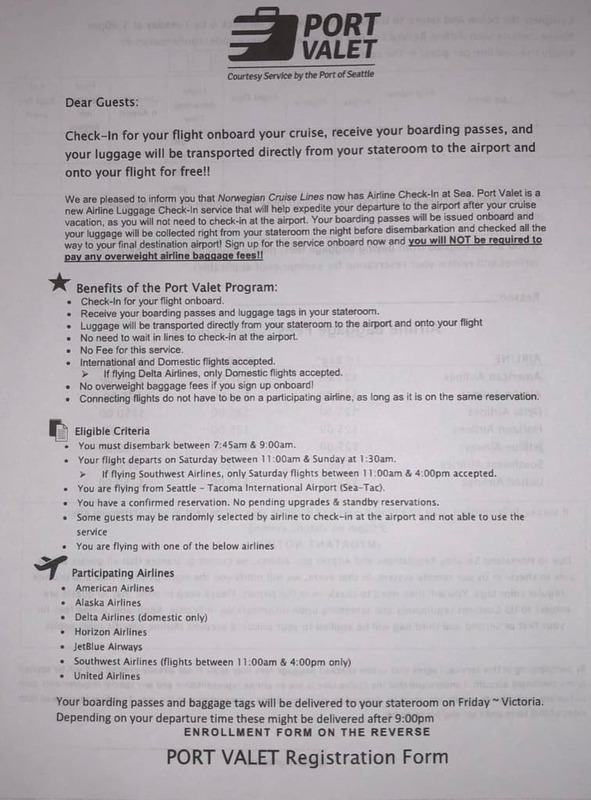 The Port Valet document will also indicate any baggage fees associated with each airline unless you are exempt. You will have to provide a reason for the exemption. Additionally, using this service will allow you to check in to your flight as well. This is one of the reasons why they will ask for your flight info. The night before the end of the Alaskan cruise, your boarding passes for your flight, and special baggage tags will be delivered to your stateroom. 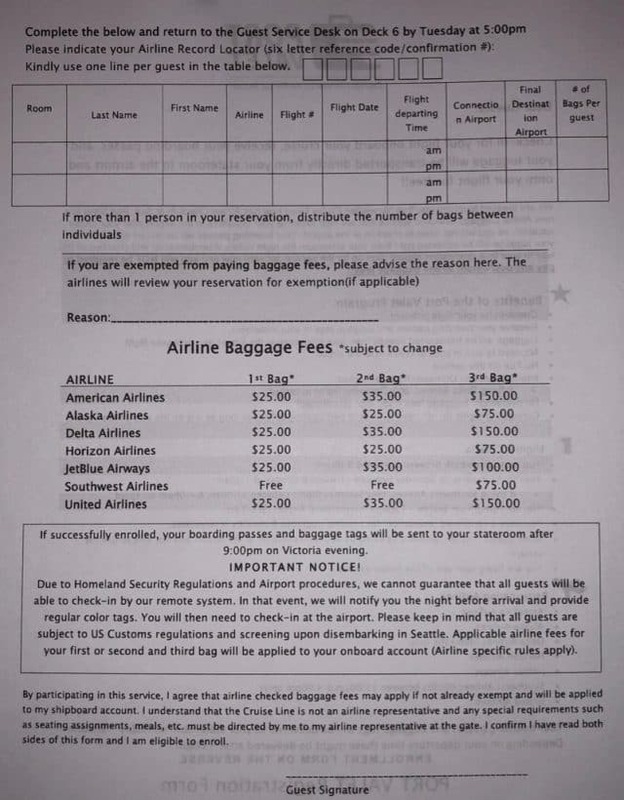 Be sure to tag all of the luggage that you plan to check. Give an accurate bag count when filling out the document at Guest Services so that you can get the right number of tags. You can track your bags here. Depending on the cruise line, you may be exempt from overweight baggage fees. Your luggage will be securely transferred directly from the cruise ship and checked in with your airline to your destination airport. You don’t have to do a thing. Be advised that not everyone may qualify for this program. You may be randomly chosen to check in at the airport with your bags in tow. You will be notified the night before port arrival if this is the case. Either way, be sure to read the entire document so that you will know what to expect from the program. The Port Valet is available for cruises docking at Smith Cove Terminal at Pier 91 and Bell Street Terminal at Pier 66. Can you imagine the freedom in disembarking from your dream Alaskan Cruise with only your carry on? If you have a later flight, it’s a perfect opportunity to tour the city of Seattle unencumbered! Not to mention that you can bypass check-in at the airport because you will already have your boarding passes. Happy Sailing! The post Thermophore Heating Pads are the answer for NAGGING BODY PAINS! appeared first on A View To A Thrill . 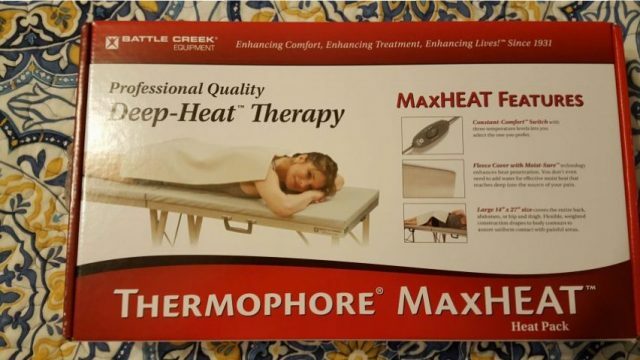 The Thermophore MaxHeat Moist Heating Pad is the answer to the one truth that no one can dispute. At some time or another, you will experience pain….whether that be muscle, arthritis or simple sprains. 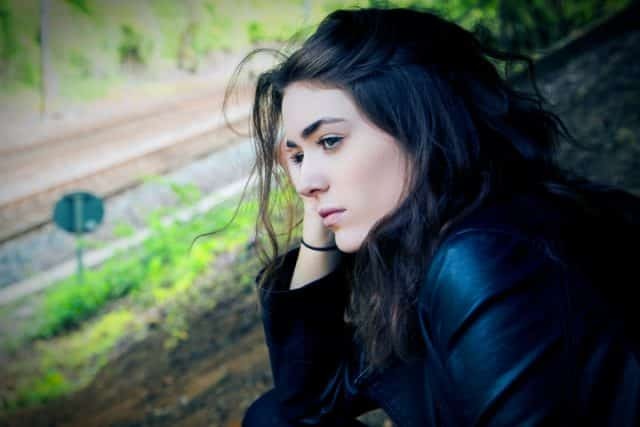 Such pains can come from injury, overexertion or simply getting older. Whatever the reason, you will eventually need relief. I wanted to share a wonderful discovery that has aided me in my battle with arthritis. A Heating Pad! Alright, maybe I need to qualify that statement. It’s not just any heating pad, it’s a lifesaver. When I travel, I love to discover a lot of off the beaten path venues. That means a lot of walking up and down hills, winding roads, peaks, and valleys. You can imagine how my body feels at the end of the day and the fact that I suffer from arthritis doesn’t make it any easier. Enter this miracle worker, Thermophore MaxHeat Moist Heating Pad. Unlike many of the heating pads that I’ve owned over the years, it’s provided consistent relief for me. As you probably know, I am thrifty, so I wasn’t eager to spend $60.00 on a heating pad. Until I realized how much I had spent over time with pads that always conked out on me and was never that great, to begin with. I lost more than I had ‘saved’ when all was said and done. Since I’m tall, I always spring for the large 14″ x 27″ size which provides maximum coverage for my poor, overworked knees. It’s handy when I am experiencing lower back problems too. I figure, why chance it? Get the largest size and that will cover any issue you may be having. 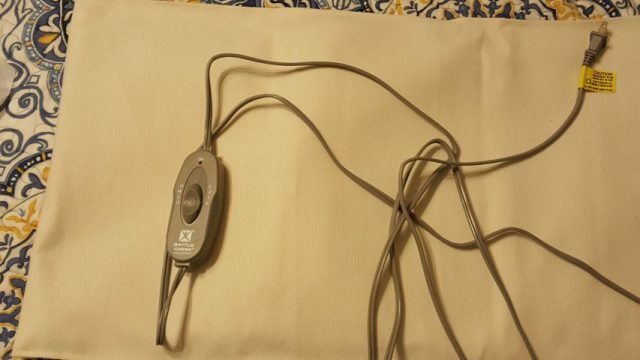 The heating pad gives you therapeutic relief in 20-minute increments. Once the 20 minutes are up, the pad will automatically turn off. Trust me when I tell you that I have tried many different brands over the years and nothing has come close to providing the soothing relief than this brand. You can feel the deep penetrating moist heat from the pad that I can feel down to my bones. It’s nothing short of amazing. I’m glad that it shuts off automatically after 20 minutes, otherwise, I would be tempted to leave it on all night. 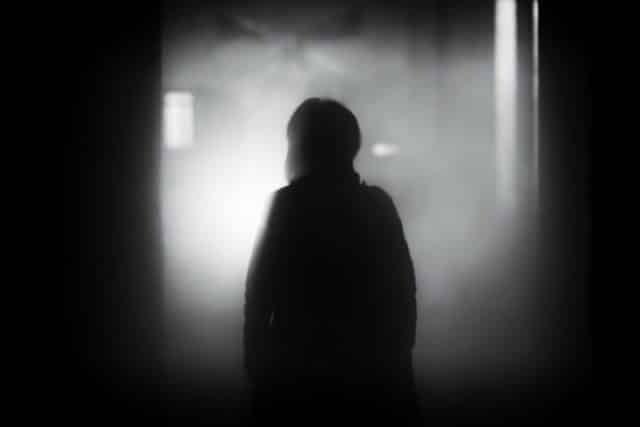 One of the best advantages to owning it is that it lulls me into a deep, peaceful sleep whereas before, I could only concentrate on the pain and muscle stiffness and staring at the walls all night. The pad has three heat settings and comes with a washable, fleece-like cover which adds weight to the pad and prevents the pad from easily slipping. It travels very well in a medium-sized packing cube. They offer a heating pad with a toggle switch that you would have to press down to receive heat (or place under your body to hold it down). 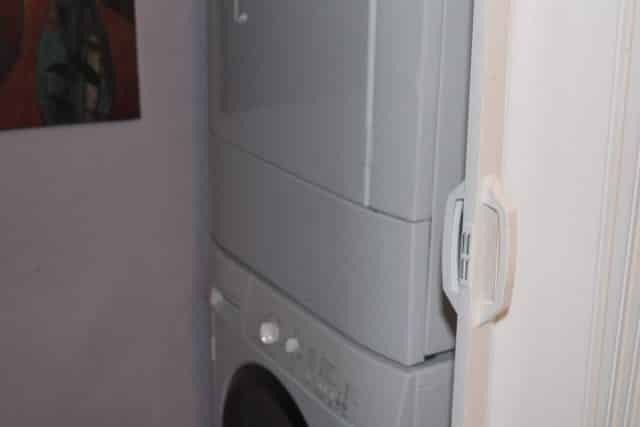 It will heat as long as you hold the lever down, that could be tricky while sleeping, you could potentially keep it on too long which wouldn’t be advisable. If you have been searching for relief from chronic pain, this is your solution. Don’t spend another day in pain and agony, purchase a Thermophore today! Disclosure: A View To A Thrill is a participant in the Amazon Services LLC Associates Program, an affiliate advertising program designed to provide a means for sites to earn advertising fees by advertising and linking to Amazon.com. The post One of the best hole in the walls in Cuba, El Chanchullero Restaurant! appeared first on A View To A Thrill . I’m not exactly sure why some of the best places to experience exceptional meals can be found in nondescript, off the beaten path, juke joints. 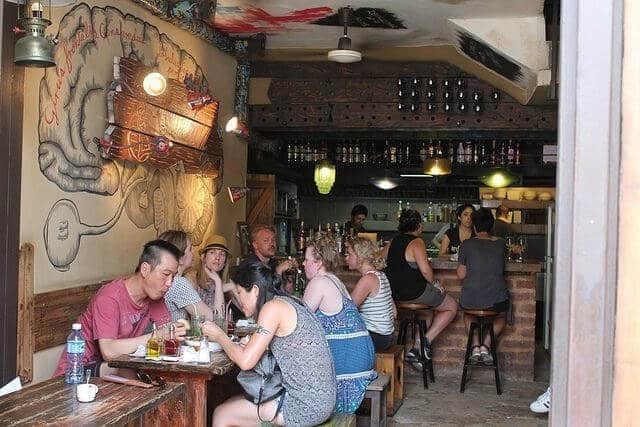 We’d heard fantastic things about El Chanchullero, a restaurant in Old Havana that intrigued us, so we decided to go check it out. I will caution you. You can easily pass without noticing it. Maybe that’s why you will see a server standing outside fielding questions from foreigners about how to find El Chanchullero! Once we realized we were at the right place, we stepped inside. The old, rustic building has three levels within its narrow footprint. The first level is pictured below. The second level is weird. There is only one table there sitting inside of what looks like a jail cell. The third level is their petite rooftop bar which allows you to see the Old Havana courtyard. Yes, there was only one empty table on the ground floor. There are two tables on the other side, but they were occupied too. It’s so tight, you will get to know your fellow diners very well. We didn’t have to wait for very long to get our menus which were happily in both languages. We tried to focus on ordering, but it was difficult to do so with our eventual server, Yudi, walking around. 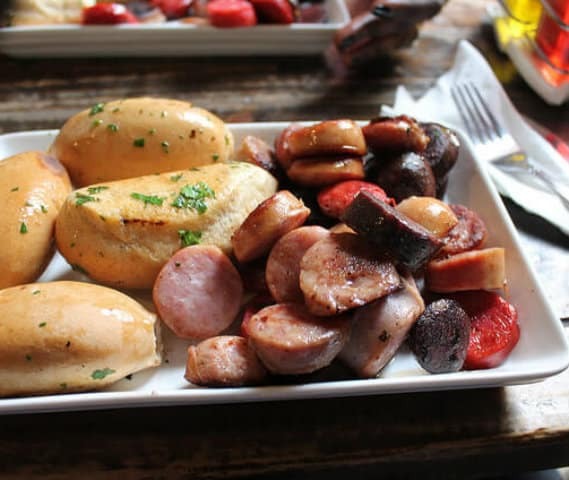 We noticed that the prices were exceptional and if we were really starving, we would have ordered every tapas dish, but we decided to go ahead and place two orders of the Chanchull assortment. It was a mix of sliced smoked sausages, chorizo and yeast rolls. The meat was smokey, spicy and flavorful and only cost 4 CUC each which is pretty much the equivalent of $4.00USD!! You could literally get full eating this delectable dish. It may look like a small dish but it was very satisfying. 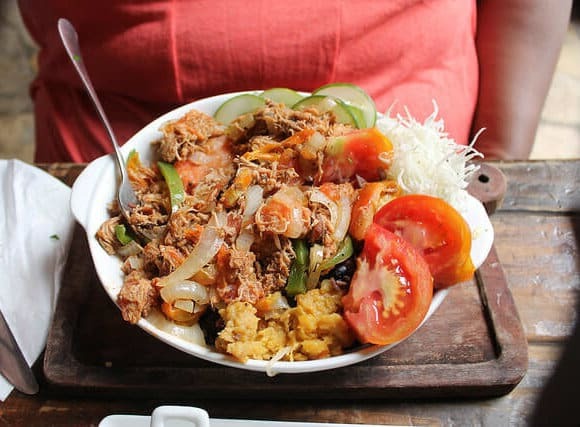 Our server recommended the Ropa Vieja, which literally translates into “old rope”! Didn’t sound really appetizing but we’re in Havana, right? Why not try it anyway?! It was surprising to see the finished product when Yudi set it on our well-lived, small table. 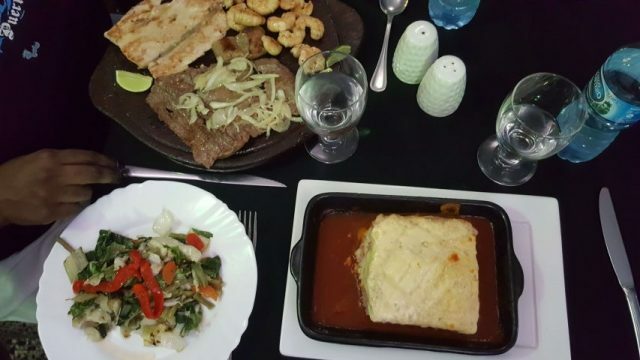 This dish is enough for two people to share easily….unless you’ve come with a huge appetite! The dish was a hearty serving of sauteed pulled pork with green pepper, tomatoes, and onions in a 10″ bowl. It was garnished with fresh cucumbers, shredded white cabbage, tomatoes and sweet potato mash served on top of black beans and rice. We literally couldn’t eat it all, so we had them put the remainder in a doggy bag. Cost? $4.50 USD! 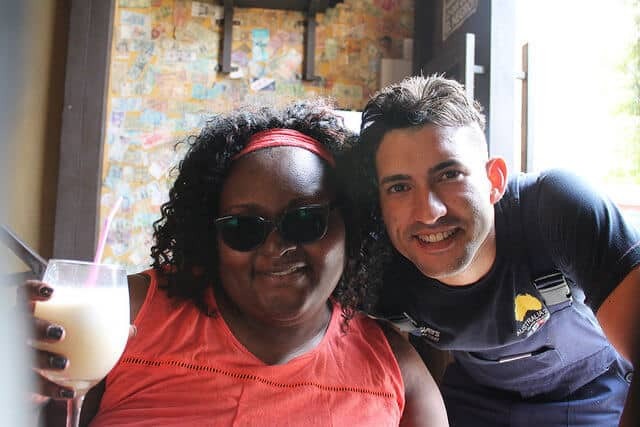 Yudi poses with Carisa as she enjoys her $2.00 Pina Colada!! Overall, the service is great and the food and drink were exceptional. Reservations are recommended, but we were able to just walk in after a short wait. 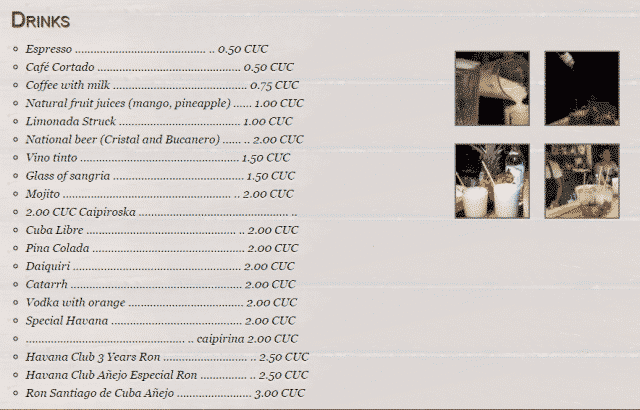 If you are planning a trip to Havana, do make plans to visit this wonderful establishment. You will always get more than your money’s worth! The post Want Cash back on your purchases? Sign up for Ebates.com! appeared first on A View To A Thrill . Welcome to the world’s largest no-brainer! How cool would it be to get cash back on all of your online purchases? I’m a firm believer of saving every possible penny that I can while online shopping. There are some absolutes: You have to pay taxes on your purchases and you will rarely be able to negotiate on sales prices. The good news is that there are coupons that you can use to help offset the cost of your purchases but even better, there are programs like Ebates.com that will actually rebate a portion of your purchase back to you via a check that they will mail to you or to your PayPal account. To sweeten the pot, you can also find coupon codes to your favorite stores on their website. I like keeping most of my money. What about you? Think about it! 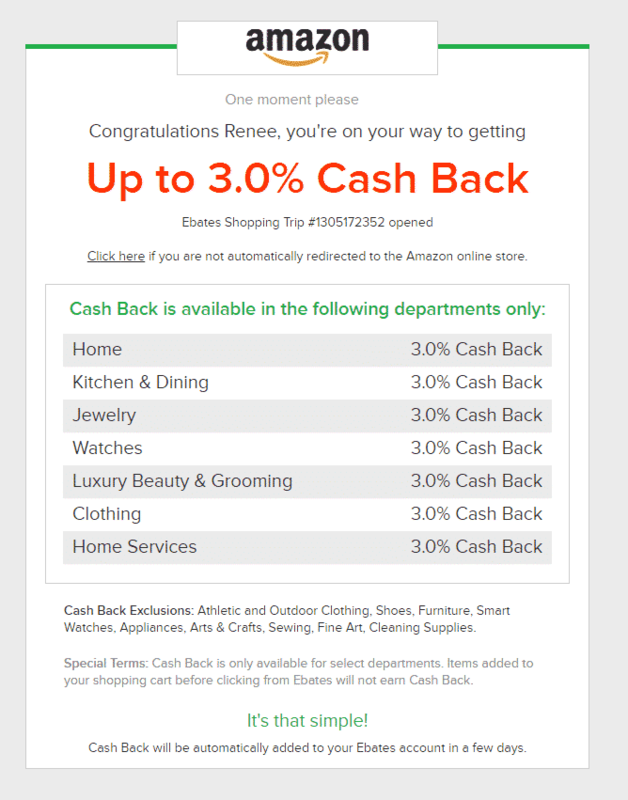 How fantastic would it be to receive cash back from purchases you would normally make anyway? At first glance, the site can be overwhelming, but don’t let that stop you. First, decide which vendor you would like to shop from via their shopping portal of over 2,000 stores. Once you find your store, you will see what percentage of your sale will be refunded to you. Click on ‘Shop Now’ and a new window will open that will take you to the store’s website. 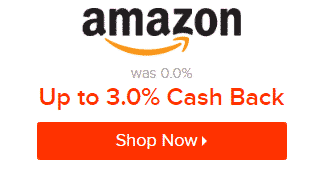 Once I’d clicked, I saw a confirmation that I would receive up to 3% cash back from Amazon. Once there, proceed to shop as usual. Each time you click on an Ebates link, a shopping trip number is assigned. This is how Ebates will be able to track your purchases once your order has been placed with the vendor. 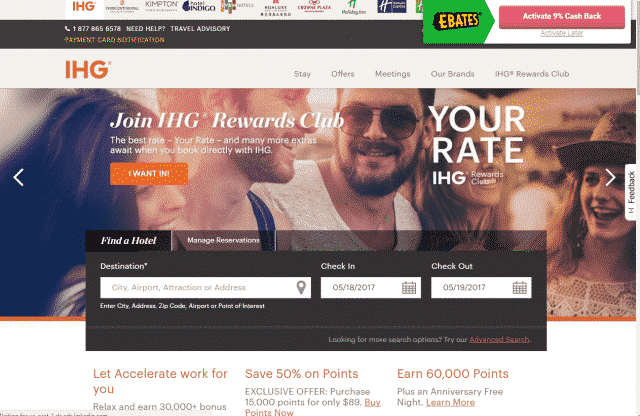 Within a day or two, you will receive an email from Ebates confirming that your rebate was applied to your account. Generally, it takes 3 months to receive your rebate. The good news is that any monies that you’ve accrued within those three months will be sent to you via PayPal or a check. Make things easier by installing this Chrome Extension! Naturally, it can be difficult to remember to log onto the Ebates.com website each and every time you purchase online. I mean, who wants to miss any opportunity to earn cash back? I’ve solved that by installing an Ebates extension on my Google Chrome browser. From the browser, click on More Tools/Extensions, then scroll down to the bottom and click on the hyperlink: Get More Extensions. Just be sure to click on the red activation button so that you will get credit for your purchases. This browser extension has sometimes helped me to make the decision to purchase based on the amount of cash back I would be awarded. So, don’t forget this important step because you never know which vendor is an Ebates participant until you see the red activation button pop up on your screen! Remember, if you are an avid online shopper like I am, do not leave money on the table. Spend just a few moments accessing Ebates so that you can get cash back from all of your qualifying purchases. You will be glad that you did! The post How To Edit Your Photos For Free Using Pixlr Express appeared first on A View To A Thrill . PixlrNowadays, most of us take photos with our cell phones and, thanks to the cloud, we can instantly share them with our family, friends, and followers. Unfortunately, most of the pictures in our camera rolls aren’t perfect and need to be edited in some way. Whether it’s to remove red-eye or crop out some random guy’s arm, photo editing has become a necessary tool and that’s why I use Pixlr Express. Back in the day, when I wanted to edit my pictures, I’d open Photoshop and go do a few chores while the resource-hogging program loaded. Then came the tedious process of loading the photos I wanted from my digital camera onto the computer. Once I narrowed down the selection from the thirty similar looking shots of St. Peter’s Square, I had to wait again for the images to load in Photoshop. After fiddling around with different settings and plugins for hours, I’d be too worn out to upload the results of my hard work to Facebook because it was such a hassle. Thankfully, technology has made the process of digital editing a whole lot easier. 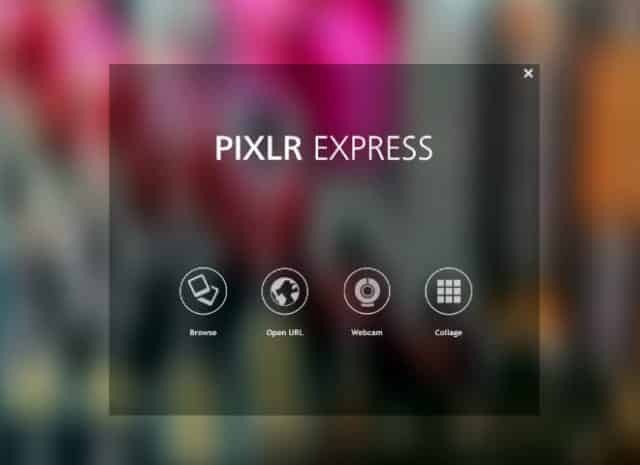 Enter Pixlr Express, an online editing application that is completely free to use. 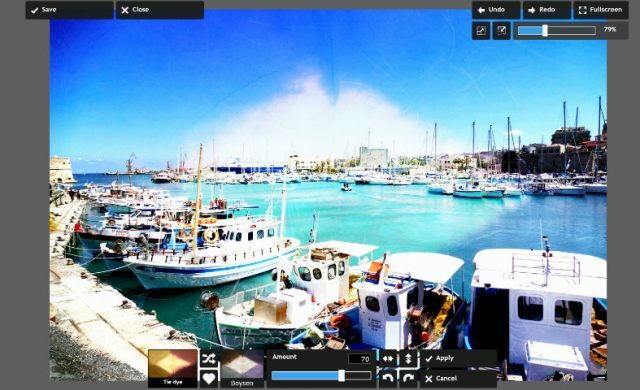 In addition to your typical editing tools like brightness, contrast, crop, resize, vibrance and hue/saturation, Pixlr includes texture overlays, stickers and a litany of other options to enhance your images. Getting started is so easy. 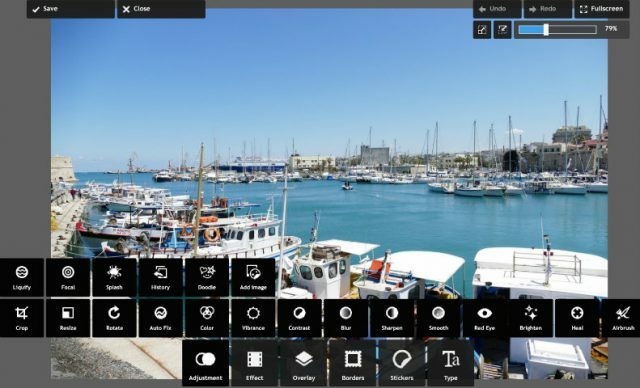 You can either browse your computer for a photo, enter a URL to grab one from the internet or take one using your webcam. After opening an image, click ‘adjustment’ and the various editing options will appear as icons over the picture. 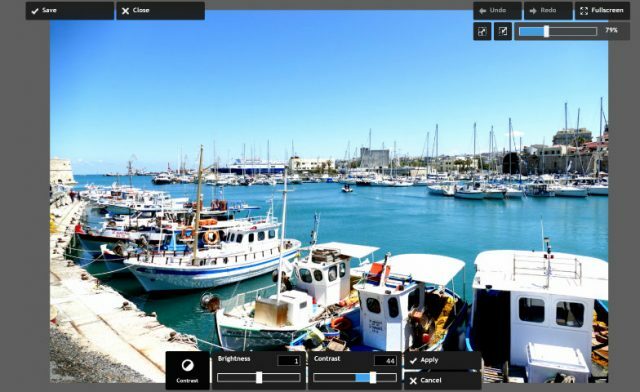 If you’re short on time, Autofix is a quick way to edit your photo. Using an advanced algorithm, Pixlr will decide what needs to be corrected automatically. Otherwise, you can choose from the many options. I typically start with resize and crop then brightness and contrast and if I’m feeling particularly adventurous, I’ll give vibrance a go. Simply drag the slider on each setting to either increase or lessen the effect. Make sure to hit ‘apply’ in order for each change to take effect. Earlier I mentioned some additional options that include textures and stickers. There are several presets you can choose from to superimpose a grainy effect over your picture. In the example below, I used a purple Tie Dye overlay. Things can get quite messy quickly so use caution when experimenting. A little goes a long way! When you’re done with your adjustments, be sure to click ‘save’ on the upper left. A window will pop up giving you a chance to rename the image and to set the jpeg compression. After playing around with borders and stickers, here is my final result! Quite Pinterestsy, don’t you think? Pixlr is available online, on the App Store and Google Play. Happy editing! 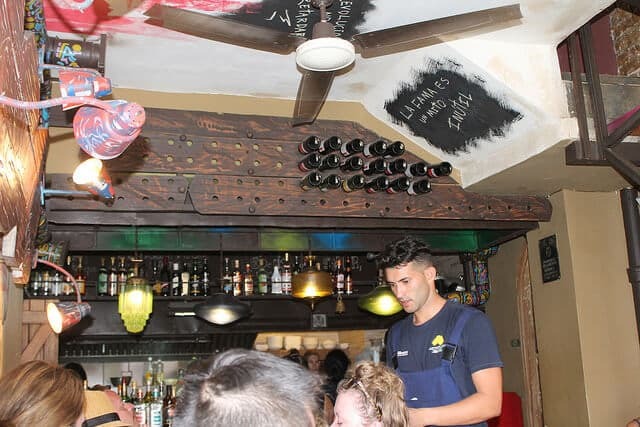 The post Our Review of Havana’s La Rosa Negra Restaurant appeared first on A View To A Thrill . 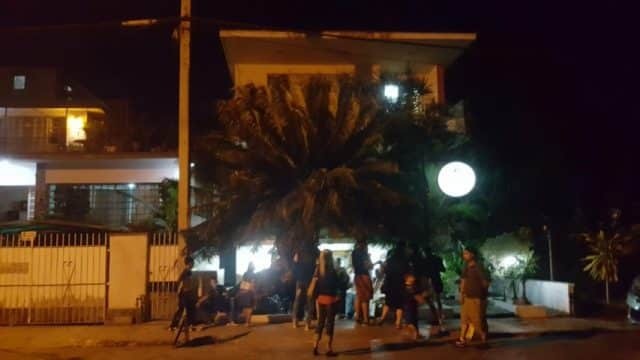 One of the lovely aspects of Havana is that most of the restaurants are privately owned concerns operated by Cuban families and are better known as “Paladars”. 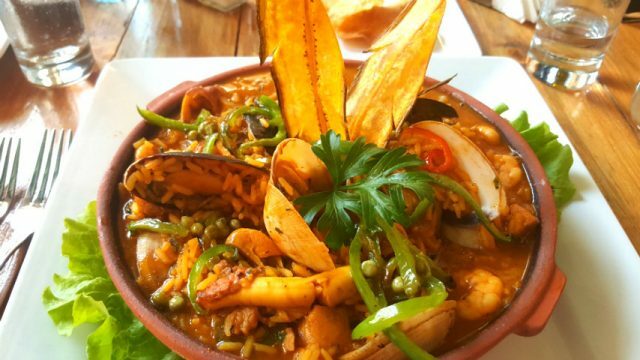 We’d heard that La Rosa Negra Restaurant was one such paladar that should not be missed. In the states, we are usually stuck with a series of branded restaurants that consistently sell uninspiring dishes to the masses and we have learned to accept our fate. 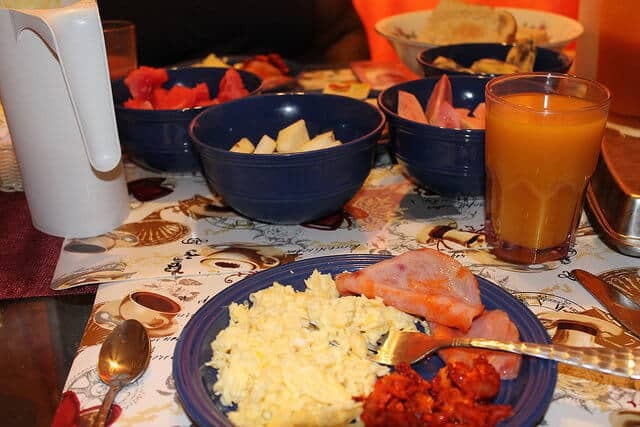 Sure, there are a few innovative mom and pop restaurants sprinkled here and there but eventually, they seem to fall in line with a concept and stray from their original purpose. As it turned out, La Rosa Negra Restaurant was a 10-minute walk from our apartment, but our lovely manager, Raul drove us there instead. The paladar is relatively unassuming. In a prior life, it may have been a basement or garage because you had to walk down what looked like a driveway underneath a house. On either side of the driveway, there were beautiful stone benches installed to accommodate guests who were waiting their turn to be called. 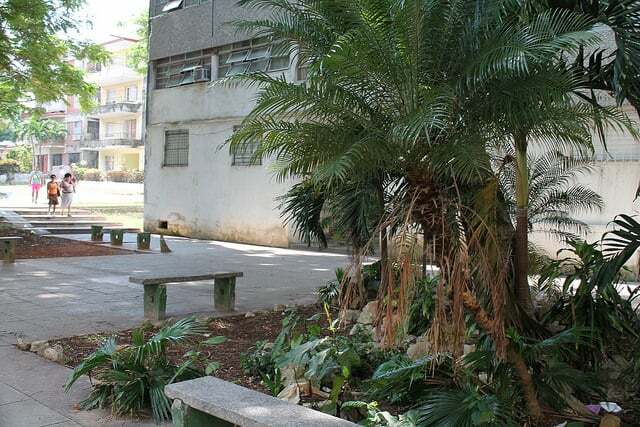 A large palm that was planted off-center, provided shade during the day and privacy for diners at night as the restaurant was very well lit. We managed to visit La Rosa Negra Restaurant twice during our trip to Havana. The first night was on a Tuesday and the foot traffic was very light, we walked right in and were seated. Our Saturday visit (see photo above) was the opposite experience because we had to make use of those beautiful benches by waiting 30 minutes for a table. Be sure to visit during the week, if you can. 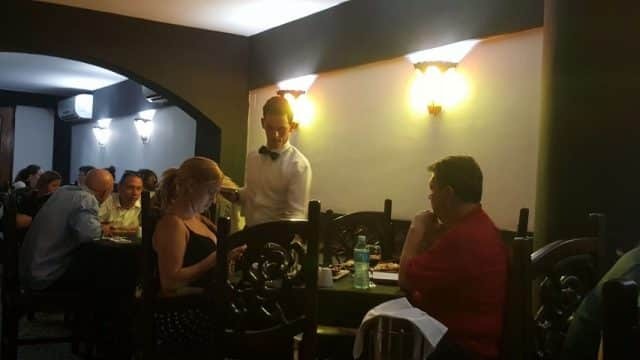 The all-male waitstaff was very polite, well-dressed in their black slacks, white long-sleeved shirts with black bow ties and a solid black apron adorned their waist as they walked proudly with white napkins folded over their forearm. Every woman’s seat was pulled out for her and Spanish/English menus quickly followed. The one thing that they had in common was that they were all very attractive, young men. The interior of the restaurant was very gorgeous. All of the furniture was solidly crafted, custom made furniture. The back of the chair featured carved roses. As small as the venue was, we never felt cramped. The waitstaff was well trained and they moved with melodic precision as they worked around each other making sure that each guest was well taken care of. As soon as our order was placed, our server swiftly removed unnecessary items from our table and replaced it with the things that we would require when our meal arrived. 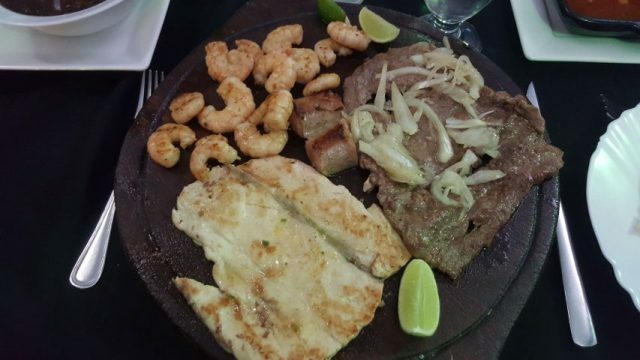 During our first visit, Carisa ordered the Mixed Grill which consisted of a delicious cut of a premium slice of beef with sauteed onions, grilled fish, chorizo, and shrimp. 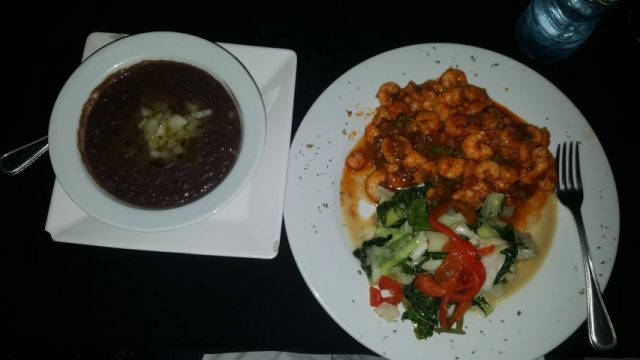 Two side dishes came with her meal, she decided to order a bowl of black beans and mixed sauteed veggies. Her meal cost $10.95 CUC. I wasn’t very hungry, so I decided to play it safe and order the Ham Lasagna for $3.85 CUC. I was curious about ham in my dish because usually, it’s beef. I’ve since learned that there is a shortage of beef in Cuba. In fact, a tourist is more likely to get a taste of it before one of its citizens because it is cost prohibitive. A steak will cost roughly $25.00 per kilo, which is totally out of the question for people who earn on average $20.00 per month. I would have to assume that this paladar is limited in what they can offer as well, hence their substitution. Nevertheless, I absolutely enjoyed my meal, but the serving was so large, I had to ask for a take-out box. Both of us asked for boxes and we were charged 0.60 CUC for each box. We decided to share our bounty because one, the food was delicious and two, there was absolutely too much of it! Our server was attentive, but not to the point of our not being able to enjoy the experience. On our second visit, I decided to order Garlic shrimp ($6.95 CUC) which came with two sides. I, a former hater, of black beans – ordered black beans this time around because it was absolutely delicious the last time we were there. Prior to this, I had never tasted black beans that didn’t make me want to retch. However, I would gratefully pay the owners for this recipe! Whatever you do, order it, you won’t regret it. I completed my selection with the sauteed veggies which were slightly on the salty side, but still tasty. Carisa ordered a Pizza….my first thought was, “Meh”….but that was before I saw it. It was a bit smaller than a large pizza that you would get at a Dominos, but it was virtually a platter of meats and it was scrumptious! 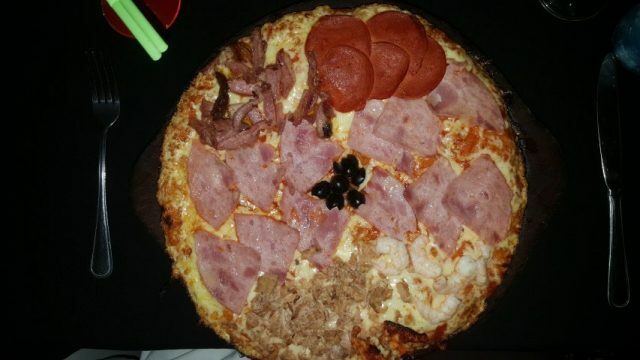 The crust of the La Rosa Negra pizza was crunchy and topped with sauce and cheese with bits of ham, sausage, tuna, shrimp, and bacon and cost $5.95 CUC. Needless to say, she had to take half of it back to the apartment. What the heck? I decided to order my first Mojito ever, so it was quite appropriate that it would happen in Havana!! It was so tasty and I’m usually a lightweight when it comes to alcohol, but I was only slightly buzzed. My drink cost $3.95 CUC. 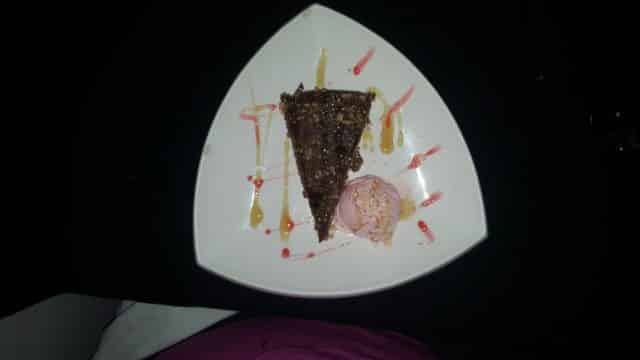 Of course, it was the night before leaving Havana, so we had to indulge in dessert. Up to that point, we had very few sweets, so we were excited to order a slice of chocolate cake with a side serving of strawberry ice cream for $3.95 CUC. After paying our tab, our server gave each of us a beautiful rose and thanked us for coming. It was a lovely ending to a beautiful experience. Please be sure to pay La Rosa Negra Restaurant a visit if you happen to find yourself in the Vedado neighborhood in Havana, Cuba! 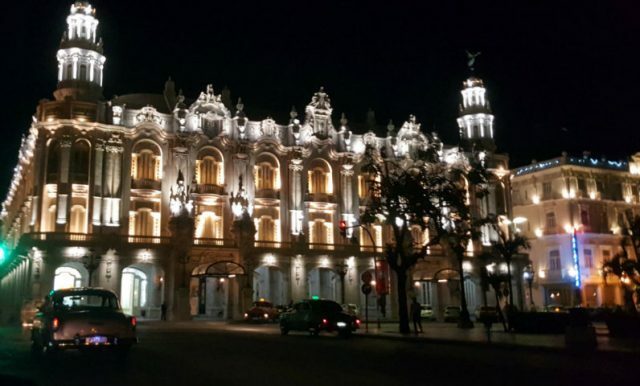 The post Top Ten Things to know about traveling to Cuba appeared first on A View To A Thrill . 1. While American travelers can now travel to Cuba, their travels must fall within one of twelve categories. You cannot travel simply for the sake of traveling. Additionally, you must have a tourist visa when visiting Cuba. Your airline carrier can assist you in securing a tourist visa. Before departure, you will be asked to fill out your official visa paperwork which should be kept with your passport. At the gate, crew members repeatedly told us to take our time filling out the paperwork because Cuban officials are very particular when it comes to inaccuracies. A single mistake, like missing a letter, will result in paying another visa fee and starting all over. 2. While at Baggage Claim, your assigned carousel can change at any time and the wait can be horrendous. 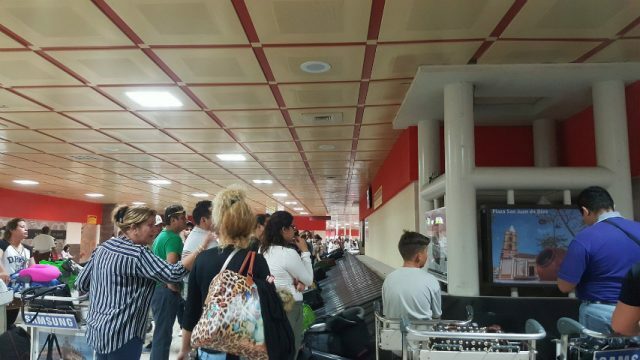 In the three hours we waited for our baggage to arrive, the baggage carousel changed no less than four times. The aisle in between the carousels are very narrow and fills up quickly so you can imagine the chaos that ensued when trying to locate our luggage. 3. Luggage carts are free to use. The carts are located at the far end, near cargo pickup. 4. Do not, under any circumstances, drink their tap water. Or you will end up with Traveler’s Diarrhea. It’s okay to rinse your mouth with tap water while brushing, but do not swallow it. 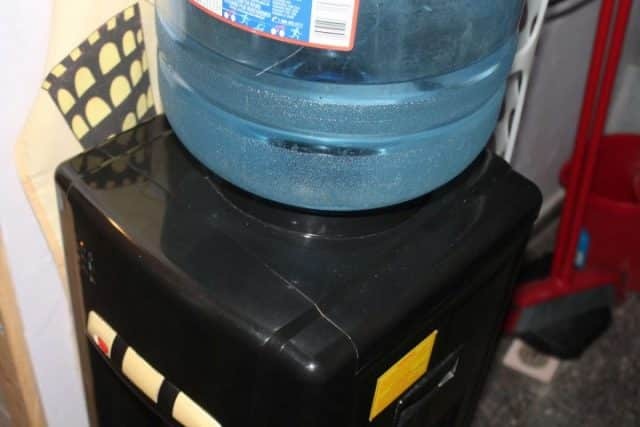 When purchasing bottled water, make sure the cap is sealed. 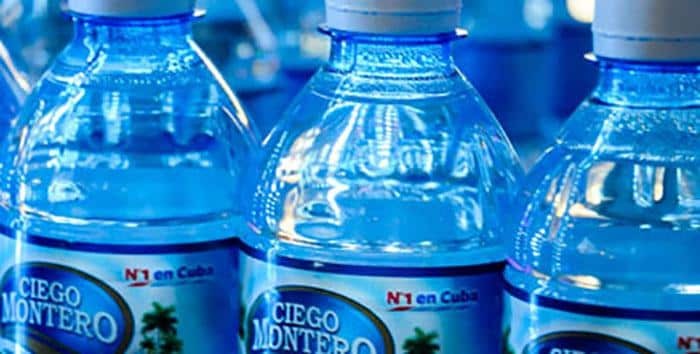 If you want non-mineral water, ask for agua natural or agua sin gas. 5. You should consider exchanging your money before leaving home. 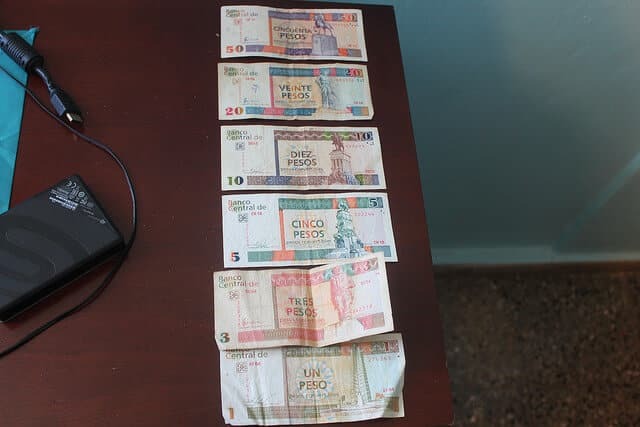 If you attempt to exchange USD to Cuban Convertible Peso (tourist currency or CUC and will have landmarks on the face of the currency; CUP the currency for natives have people on the face of the currency.) 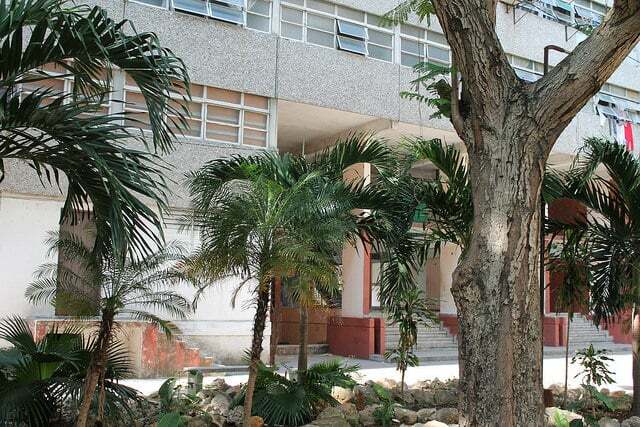 when you arrive in Cuba, you will lose a lot in the exchange due to fees. There is a 10% penalty (due to the US embargo) and a 3% service charge when exchanging USD to CUC. If you exchange your money from USD to Euros while you are in the states, you can exchange those Euros to CUC upon your arrival in Cuba. 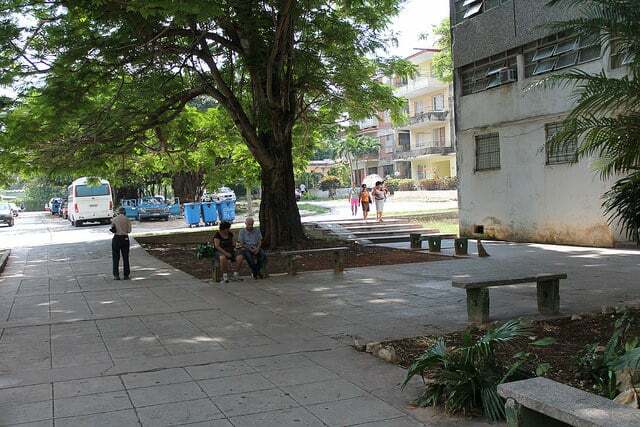 Cuba has always accepted Euros since there is no embargo between the two and fewer fees as a result. However, you should consider the service fees and the USD to Euro exchange rate when taking this option. If it turns out to be less than the USD to CUC rate in Cuba, then you should wait until you arrive in Cuba. While many people choose to exchange monies at the airport, we’ve found that you will get the best rates at local Cuban banks. However, banks will not accept damaged or torn money for exchange. Two things to remember when utilizing their banks: First, the operation of cell phones or cameras are prohibited when inside. Second, while at the teller window, only one person at a time is allowed to conduct business. If no teller is available, you must take a seat to wait your turn. 6. 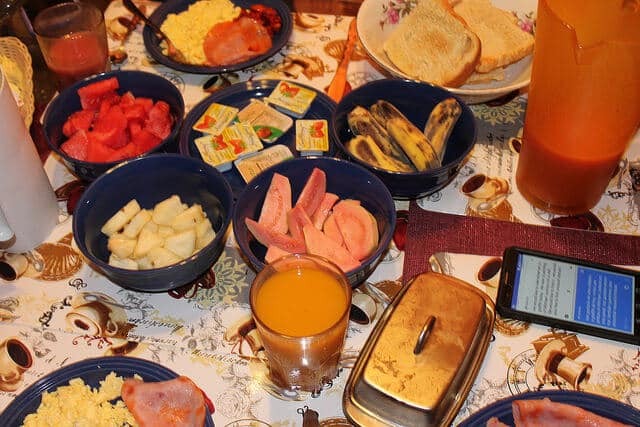 The most inexpensive way to eat breakfast is to have your host provide it with your room rental. 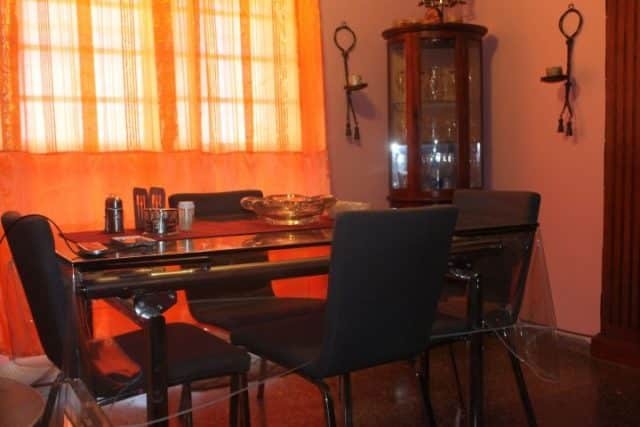 It will usually be for an additional fee, but some hosts will include it in the rental price. 7. Restaurants will charge extra if you need to use a doggie bag. Portion sizes are extremely large, so you may find yourself sharing your food with your table mates. 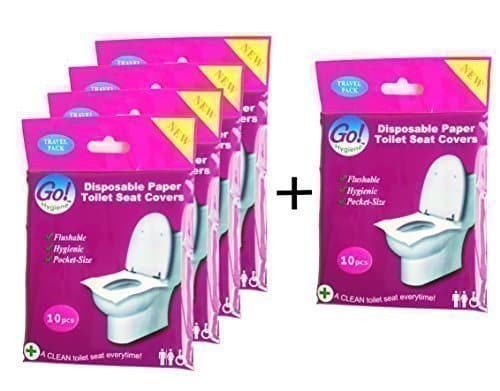 GoHygiene: Travel Pack of 4 PACKS (40-COUNT) + 1 FREE PACK (10-COUNT) ! 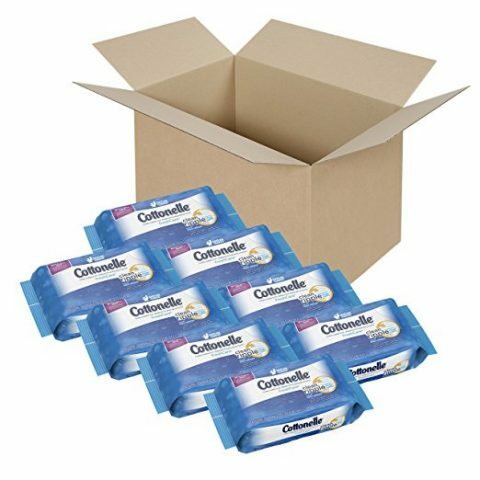 – Disposable Toilet Seat Covers – NEW! 9. You cannot flush the toilet paper. Their sewer system is not capable of breaking down the fibrous material. You can dispose of used tissue in the small trash can provided in the restrooms. But be aware that some establishments may not provide tissue, so bring your own or you may want to purchase personal wipes instead, but still, do not flush them! 10. WiFi access is almost non-existent on the island. However, you can access it in limited areas by purchasing a WiFi card for a nominal fee. Wifi cards can be purchased at a few hotels in Havana or on the upper level of the airport upon arrival. You will only be able to get service in public areas like parks or hotels. Chances are if you see several people on their phones, they’ve most likely accessed an elusive signal. 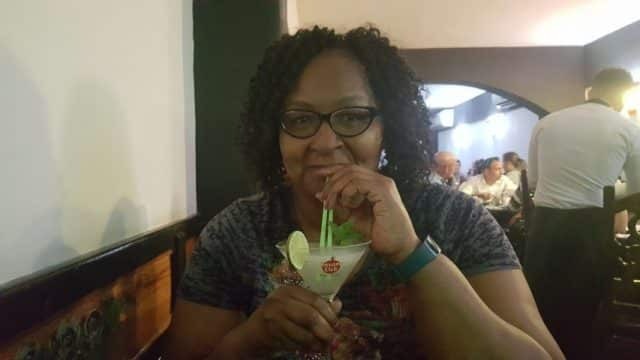 Full Disclosure: Renee King is a participant in the Amazon Services LLC Associates Program, an affiliate advertising program designed to provide a means for sites to earn advertising fees by advertising and linking to aviewtoathrill.net. In other words, if you click on the above links and purchase an item, it means that I will be able to continue (with reckless abandon, I might add) my Chai Latte addiction. Thanks! 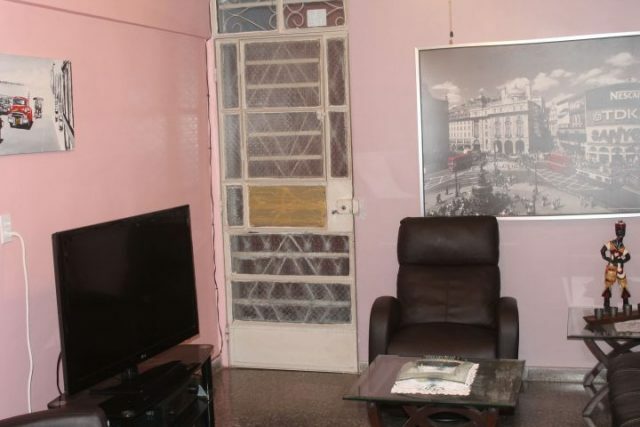 The post A Review of my Airbnb apartment in Cuba! appeared first on A View To A Thrill . We’d decided to forego Casas in favor of renting an entire domicile because we really do like our privacy and don’t necessarily feel comfortable sharing space with others. To that end, we opted to look for an entire apartment or house rental on Airbnb.com and Homestay.com. The photos displayed on the site was impressive. The apartment had two bedrooms with queen beds and a couch that let out into futon-like bed. The living room had two leather chairs and a 60″ screen television set. The dining room table could accommodate at least four people and is situated in front of a set of french doors that led out to the balcony where you could enjoy the view from 10 stories up. It has a free-standing A/C unit in the corner that cooled the living and dining rooms. There is no central air in the building. 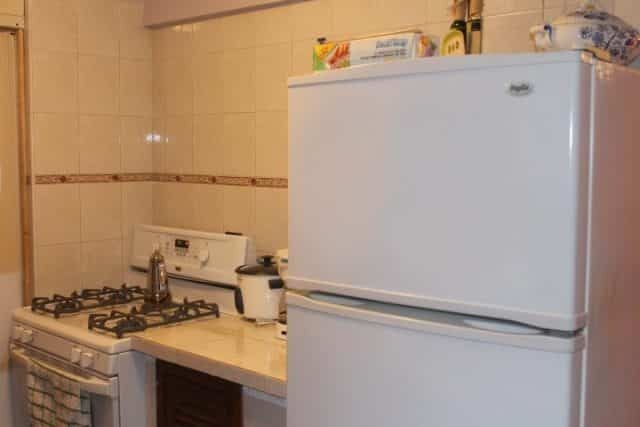 At times, the A/C was too cold, that’s how phenomenal the units were. 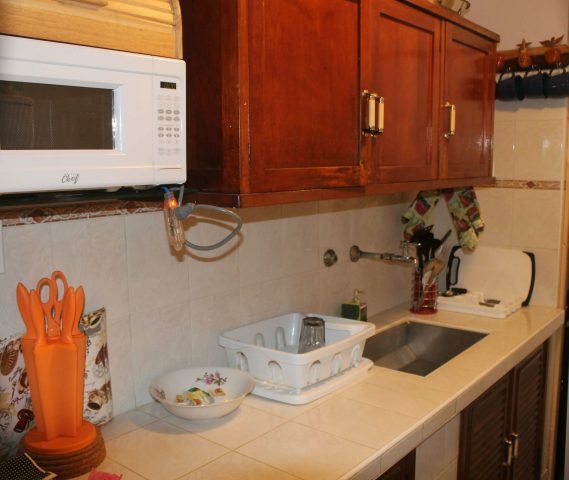 The kitchen was fully appointed with everything any cook could possibly want or need. The only thing that it lacked was food! Right beyond the kitchen was an accordion divider that hid the utility room. The utility room housed a stacked washer and dryer set, a tankless water heater and a huge water dispenser with a laundry sink just behind it. As two single women, naturally we were concerned about security issues. But we needn’t have worried. The front door is fortified and has a security door that is made of wrought iron. A motion sensor light is installed right above the entrance. The french door adjacent to the dining room has bolts on each door. 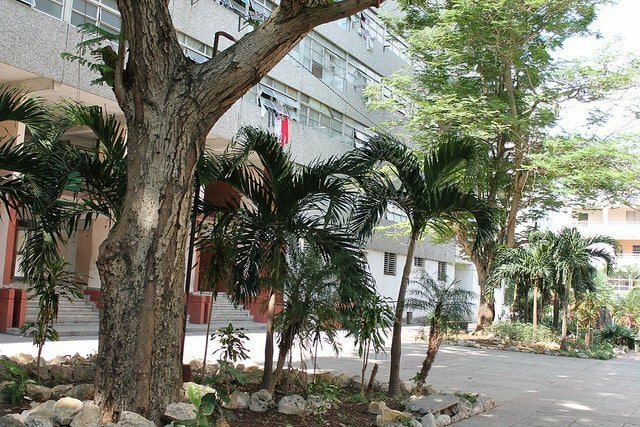 The building is pre-60s, so while all of the buildings have definitely been affected by the U.S. economic embargo, they have managed to keep it sound and in good repair. 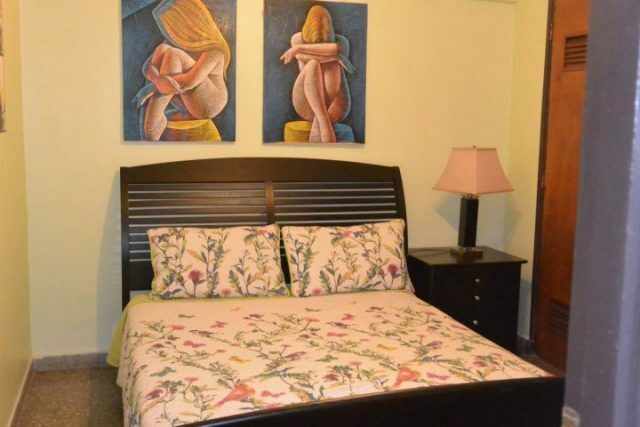 Each bedroom had a queen bed, a mirrored dresser, nightstand and bedside lamp. 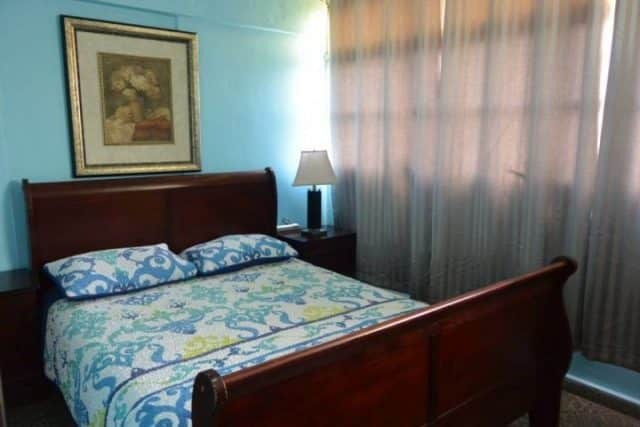 Each room had window a/c units and roomy closets with hangers and a tall laundry basket. Marlene was thoughtful enough to have an umbrella in each closet because it comes in handy to keep you protected from the sun. The bathroom had an oversized shower that could fit two. We were provided with a body wash dispenser and a commercial type toilet paper dispenser. Please be aware that both items are scarce in Cuba, so I was surprised to see them because I had brought my own. I think the best feature of our accommodation was our magnificent host manager, Raul. I can’t begin to tell you how fantastic he was to us. He arranged our airport pickup/dropoff and our day trip to Vinales. He could speak very little English which matched our deficits in Spanish but we managed to communicate wonderfully via the offline version of the Google Translate app. Currently, WiFi is practically non-existent in Cuba. We were able to communicate well, so that’s all that mattered. 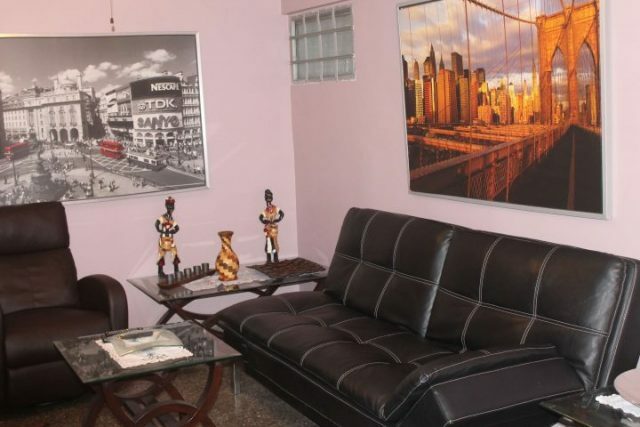 Our apartment was very centrally located in the Vedado community. Restaurants were within walking distance, as were banks, hotels (where you were most likely to get a WiFi signal if you purchased a WiFi card from them or at the airport), markets and small businesses. 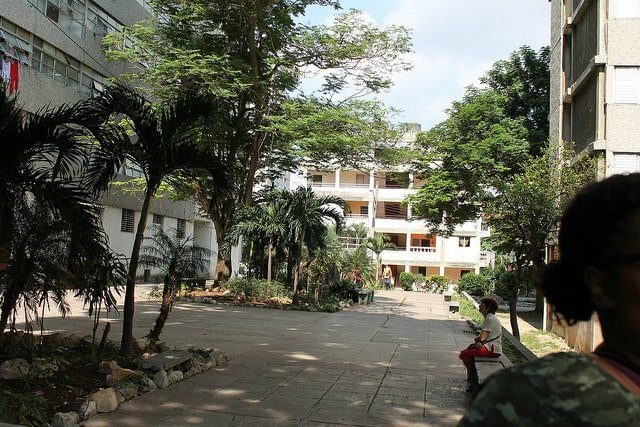 If you have any trepidation about visiting Cuba or feel that your lack of Spanish will be a hindrance, don’t let that stop you from visiting this magnificent city. We canceled one of our day trips because we wanted to devote more time to explore the city because it is massive. We’re so glad that we did because it gave us a chance to be less rushed and to enjoy every aspect of it and we still haven’t scratched the surface. I would still encourage you to learn basic words like Hello (Hola or Buenos Dias), Goodbye (Adios), Thank you (Gracias), etc. There are plenty of phone apps that you can use that operate offline like Google Translate. Just keep in mind that internet service is a RARE commodity there, so don’t expect to use it much (and never if you don’t have a WiFi card). If you decide to book (and I hope you do! ), please tell Marlene that I sent you! Have a fantastic time in Havana! Pssttt……if you are new to Airbnb, use this link to sign up. You will save $40.00 off of your booking. Full disclosure, I will get $20.00 once you’ve booked. Gracias! Once you have signed up, you can book the apartment. The post How to achieve a dream with little or no support system in place appeared first on A View To A Thrill . Universal Truth: Not everyone will cheer for you. Not everyone will want you to achieve your dreams. In fact, some will actively try to make sure that you don’t. It’s wise to be aware of this fact while at the same time acknowledge that ultimately you hold the power to fail or succeed on your own merits. When we begin to listen to the whispers that “You’re trying to do too much”, “The chances of you failing is pretty high”, “I think you’re living a pipe dream”, it’s easy to get discouraged. It’s difficult to tell if they are genuinely concerned or are bitter naysayers who wouldn’t have the courage to follow through on a dream if their life depended on it. Not everyone understands that there is something that compels you that doesn’t really require their understanding. 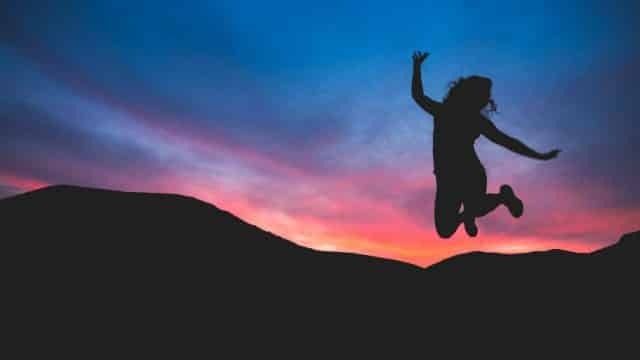 There are forces at work that you may have tried to ignore in the past by convincing yourself that you were reaching too high, trying too hard and possibly getting nowhere. Fast. At the same time, keep in mind that not all critics are trying to destroy your dream. Examine the objections that they put forth by asking yourself if you’re being realistic about your goals? There’s nothing wrong with doing a complete assessment of the viability of what your plans are. Look at it from every angle. Be your toughest critic and ask the hard questions and answer them as if you don’t have a stake in the game. Use those seemingly negative comments/inquiries to your advantage by doing some serious introspection. Find your tribe. Search for like-minded people who are trying to do the same thing that you are trying to do. Join clubs, meetups, Facebook Groups in the field that you are looking to enter. Most people are all too willing to help and believe in paying it forward. Despite how it may seem, people really do care and can be very supportive in helping you to get to the next step. You simply must seek them out. The most important thing is that you must believe in yourself. Nothing ever gets done if your heart isn’t in it. It has to come from deep within and there is no faking it. Either it’s there or it isn’t. 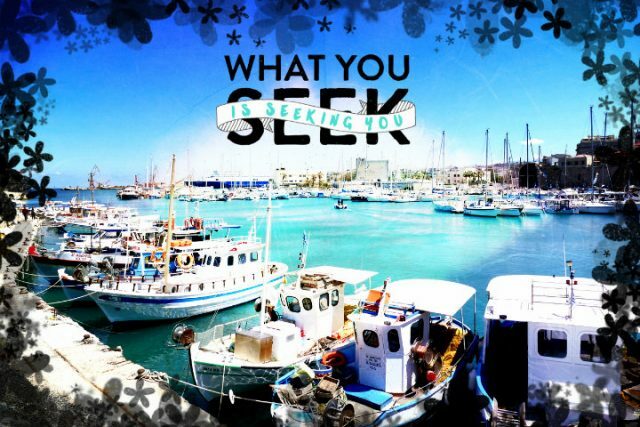 There is literally nothing that can stand in your way if you are determined to see things through. Having a little faith in what you can accomplish can reap big dividends. While it would be nice to have someone on the sideline cheer you on, it’s not necessary. You will fail and/or succeed based on the amount of effort, blood, sweat and tears that you put into it. This could mean a very solitary existence for you because your focus will be on creating and achieving that dream. The good news is that it won’t always be that way. Everything that has ever happened in the world, began with an idea, a concept that sprang forth from someone’s head. It took a little faith and inspiration to see it to fruition, but essentially, it all came from the individual, not external forces. Believe that you have the power to wield similar results because what do you have to lose? The only bad idea is one that has never been tested. Recall the reason why you are doing this, what you have at stake and what your ultimate goals are and go after them. 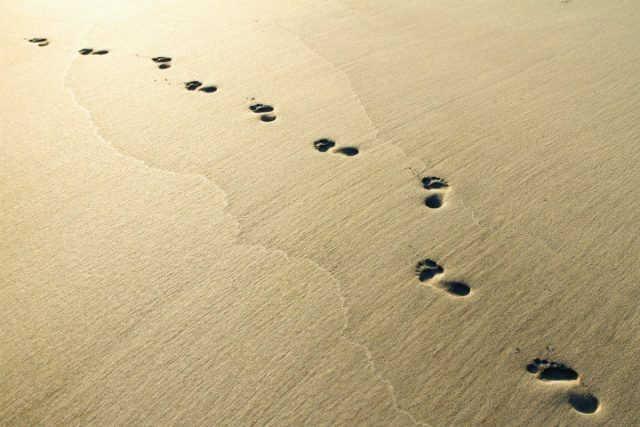 The only person standing in the way and your real stumbling block is you. Now, get busy.